Please note the following when contacting us. A very versatile size that can be used as a lunch tote or a purse. Size modeled from the brown paper grocery bags. Also great as an over-night or carry-on bag. New Stroller/Walker Tote: 10"h by 12"
﻿ (Starting at $65) standard mesh tote with photo 14"h by 12" wide bottom opening to 20"wide on top. Great for the shopping trips. Note the photo from the photo-totes gallery or provide your own digital photo and email us at info@photo.totes.com or contact us. If submitting your own photo you must have permission from the photo source. 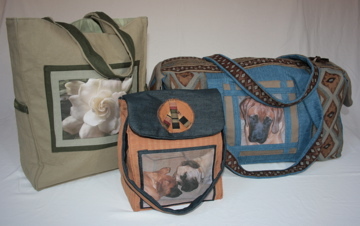 Photo-totes.com will respond with fabric and color suggestions; confirm the design, cost and shipment details with you. Select from the PT Gallery or submit your photo or questions by contacting us.